This is Jamie Oliver’s recipe. My version included half rum and raisin ice-cream with vanilla ice-cream. In retrospect the rum and raisin ice-cream was too sweet, all vanilla would work better. Get your ice cream out of the freezer so it can soften a little while you get things ready. Line a 2 litre pudding bowl with 3 layers of cling film. Use a serrated knife to slice four 2cm thick rounds off of your panettone then cut them in half. You’ll have some panettone left over, so keep this for another time. Arrange six of the slices in a single layer around the bowl and push them down if they overlap. Drizzle some Vin Santo around the sponge so it soaks in, then use the back of a spoon to smear the jam over the sponge. Add 1 tub of ice cream to the bowl and use the spoon to spread it around in a thick layer. Sprinkle in the pistachios, cherries and glacé fruit then layer the clementine slices on top. Add the other tub of ice cream. Spread it out, working quickly so the ice cream doesn’t completely melt. Put the rest of the panettone slices on top of the ice cream, drizzle over some more Vin Santo then cover the bowl tightly with cling film. Press a plate down on top to press everything down, then freeze overnight, or longer. When you’re ready to serve it, put the bashed-up chocolate in a bowl and get that over a pan of simmering water on a really low heat. 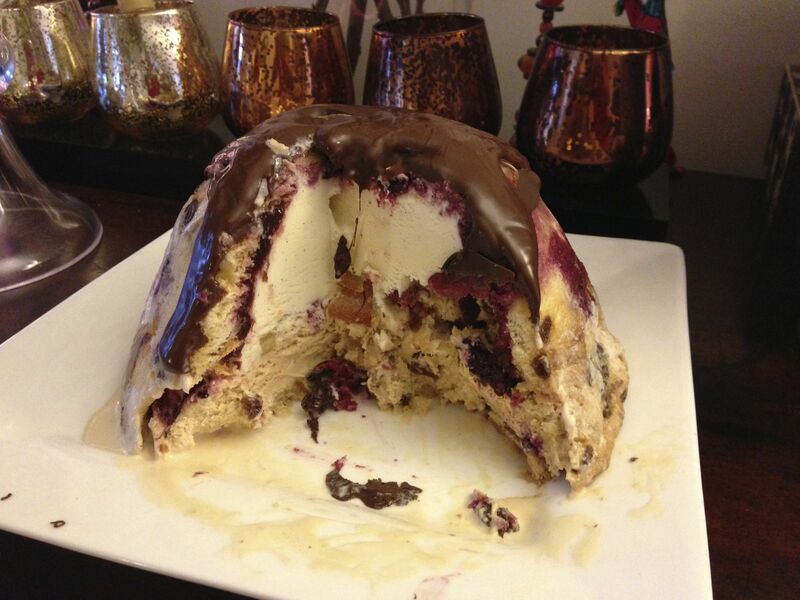 Leave the chocolate to melt while you unwrap your amazing winter bombe and carefully turn it onto a beautiful serving dish. Add a few gratings of clementine zest to the chocolate and when it’s nicely melted, pour it over the top so it oozes down the sides and looks delicious. Posted in Cakes, Dessert, Ice Cream, Jamie Oliver, Sweet Food and tagged Christmas, dark chocolate, ice cream, Jamie Oliver, panettone, rum and raisin, sour cherries. Bookmark the permalink.